PoE+ Giga-McBasic LFPT are the perfect solutions for network applications that require Power over Ethernet for locations inside buildings where PoE is required to power an Ethernet device. Their small, table-top design and durability make them perfect for installation anywhere space is limited. Additionally, both units are manufactured with an internal AC power supply. An LFPT DIP Switch is available to enable for diagnostic troubleshooting. 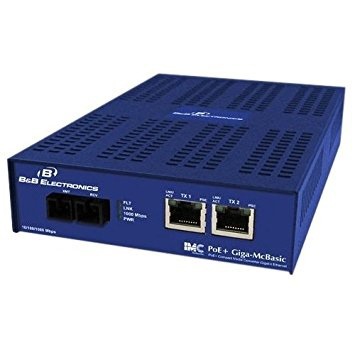 The PoE+ Giga-McBasic LFPT unit comes with one SFP or fixed fiber transceiver and two PoE/PSE 10/100/1000Base-T copper. Each port provides 25.5 Watts of power with data.